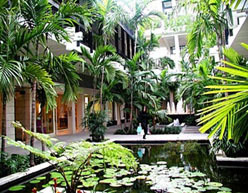 Visit the prestigious Bal Harbour shops just 7 miles North of South Beach. The mall is open Mon - Fri from 10am to 9pm, Sat 10am - 7pm, & Sun 12pm - 6pm. Parking in the mall parking lot can be costly. If you make a purchase, be sure to have your parking ticket validated. If that means buying a candy bar, it will be worth it. Another option is to park across 96th Street in the metered parking lot.